It's an issue that has bedeviled Donald Trump since he took office. Two years ago Speaker Paul Ryan, lacking support from his fellow Republicans, was forced to pull a Obamacare rollback measure from the House floor. Now, the president's renewed effort undo his predecessor's signature legislative achievement on healthcare has proved short-lived. 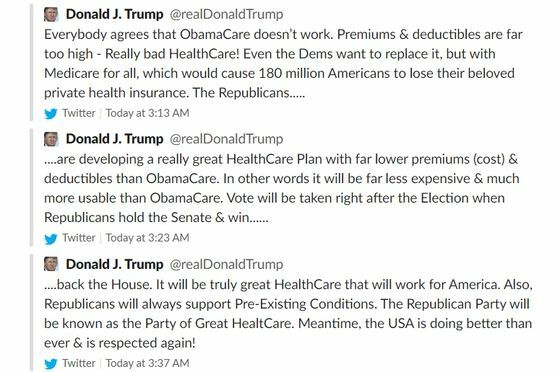 Trump said late last night that Republicans – who, unlike two years ago, don't enjoy a House majority – would wait until after the 2020 election to hold a vote on an Obamacare replacement. The abrupt decision to abandon the push, which he began last week during a rhetorical victory lap following the conclusion of Special Counsel Robert Mueller's 22-month investigation, underscores the trepidation that Republicans feel about injecting the healthcare law into the poll debate. Nine years on, Obamacare – passage of which helped spark the Tea Party movement that swept Republicans into control of the House in 2010 – has achieved widespread popularity in opinion polls, with some Democrats even advocating an expansion. So most congressional Republicans are in no mood to return to the battlefield. The question is whether an unpredictable commander-in-chief will keep step – or get out of line again. Countdown to divorce | U.K. Prime Minister Theresa May will hold a crisis meeting with her cabinet today where ministers will probably weigh postponing the date for the exit from the European Union until year's end or beyond. While Parliament yesterday rejected all options that were put forward to replace May’s unpopular plan, pressure is building from the EU side over Ireland's failure to lay out how it will protect the bloc's only U.K. land border. Testing boundaries | John Bolton is increasingly pursuing his own longstanding foreign policy priorities – at the risk of stoking tensions with Trump and top administration officials. Margaret Talev and Jennifer Jacobs report that the polarizing White House National Security Adviser's expanding influence is raising questions about whether he might be the next Trump aide to be shown the door. Bolton's agenda has included trying to break Iran financially, oust Venezuelan President Nicolas Maduro and toughen the U.S. posture toward Russia. Heartland aspirations | Democrats hoping to unseat Trump in 2020 see a chance to cut into the president's support across the rural Midwest as the White House’s trade policies exacerbate the strain on farmers stretched by low commodity prices and natural disasters. U.S. net farm income plummeted 16 percent last year, and Iowa – where the Democratic presidential nominating contest will begin – awarded two additional seats to the party in November's midterms. Erdogan stumbles | Turkish President Recep Tayyip Erdogan is facing challenging times both at home and abroad. In local elections over the weekend, the opposition pried control of the biggest cities from his alliance, threatening the foundation of Erdogan's 16-year rule. Now the Pentagon is delaying delivery of two of its most advanced F-35 fighter jets because of Ankara's plan to buy a Russian missile defense system. Australia's windfall | Prime Minister Scott Morrison’s government pledged sweeping tax cuts and forecast the country’s first surplus in more than a decade in a budget aimed at securing another three years in power. Yet the triumphant tone may prove short-lived, with opinion polls showing voters are set to oust the Liberal-National coalition next month after years of policy stagnation and crippling infighting. After a second woman accused Joe Biden of inappropriate conduct, Sahil Kapur takes a closer look at other challenges the former U.S. vice president will face if he jumps into the 2020 race to unseat Trump. Singapore's lawmakers are debating plans to impose tough new laws aimed at holding online outlets accountable with fines and jail terms for the spread of fake news. The proposal has prompted social media giants to voice concerns over the impact on free speech. Algerian President Abdelaziz Bouteflika said he will step down before his fourth term officially expires on April 28, bowing to weeks of mass protests that threatened to tip the North African OPEC member into turmoil. And finally ... Thailand isn't exactly putting its best foot forward. When Asia's top finance ministers and central bankers arrive in northern Thailand for a summit this week, they’ll need pollution masks to avoid breathing the toxic air. 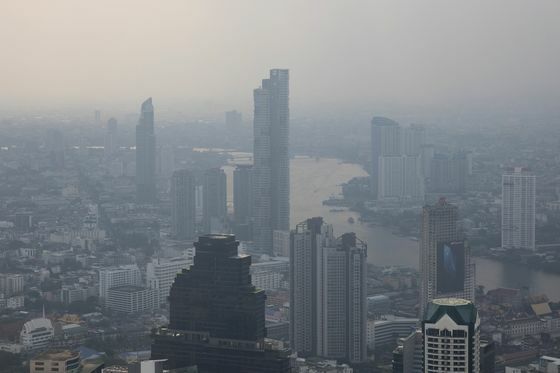 Wildfires and crop burning are blanketing the region with smog, prompting Thailand’s junta leader Prayuth Chan-Ocha to fly to Chiang Mai – the area’s tourist hot-spot – where the air quality index was a hazardous 379, the worst major urban reading globally.